That might not be all that’s in Penfold’s future either. It was a sad week in the NASCAR Whelen Modified Tour community with news that Denise Barry Dion passed away suddenly. Dion was the daughter of legendary car owner Art Barry and wife of Pro Stock driver Wayne Dion. She was well known in the pit area as the spotter for her brother Ken’s #21 entry on the Modified Tour. A memorial service will be held Sunday at 5 p.m. in the Thomas & Walter Quinn Funeral Chapel, 2435 Warwick Avenue, Warwick. Visiting hours are Sunday 2-5 p.m. In lieu of flowers, contributions to Make-A-Wish Foundation, 757 Park Avenue, Cranston, RI 02920 will be appreciated. There was another True Value Modified Racing Series event over the past weekend and once again, it was Kirk Alexander out in front when the checkered flag flew. It’s been an eventful week at the shop of the #16 Flamingo Motorsports team that is owned by Eric Sanderson. The team competes on the NASCAR Whelen Modified Tour. Bill Penfold has been idle for the 2005 racing season due to lack of sponsorship. But the Maine driver told Speed51.com that he plans to enter the NASCAR Busch North event at Oxford Plains Speedway (ME) later in the month. The week started off with the announcement that driver Chris Kopec had resigned from the ride. 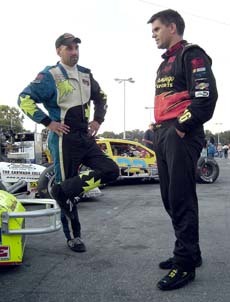 Kopec had suffered head injuries in a 2003 wreck at Thompson Speedway (CT) and sat out the 2004 season. He returned this season with several strong performances, but still felt lingering effects of his injury, especially after a wreck at Stafford midway through the season, and decided to stop driving as a result. He will stay on with the operation as its team manager. Word has come in that Kopec’s replacement will be none other than the former driver of the #16, Mike Stefanik. Last season, Stefanik split the driving duties in the car with Rob Summers and won the World Series at Thompson to cap off the season. Stefanik had been driving the #00 Brady Bunch car in 2005. There is no word who might be behind the wheel of the #16 when Stefanik is otherwise engaged in his full-time job as the driver for the #55 Burnham car in the NASCAR Busch North Series. The winner of the previous TVMRS event starts shotgun on the field, but that hasn’t kept Alexander from passing his way to the front. He has won eight of the ten TVMRS races this season. Alexander is also the defending champion of the series. Dwight Jarvis, Ed Dachenhausen, Dennis Albro and Peter Daniels rounded out the top five finishers. The TVMRS next visits Beech Ridge Motor Speedway for their first ever appearance in Maine this Saturday night, August 6th. The Stafford Motor Speedway has a busy week ahead of itself when it comes to NASCAR Touring Series action. The NASCAR Busch North Series will compete there on Wednesday night, August 10th. Two nights later, the track will open up for a Friday night vent with the NASCAR Whelen Modified Tour headlining the racing card. Speed51.com will be at both events and will have full coverage from the track. Former NASCAR Busch North Series competitor Stub Fadden had a stroke last week. The 70-something racing legend had been keeping busy in retirement by working in his grandson Mike Olsen’s raceshop. Little Trees Racing, PO Box 427, North Haverhill, NH, 03774. Penfold thinks that the Oxford show will be a good one for the fans.